In addition to conducting high-speed crash tests, the Insurance Institute for Highway Safety uses high-resolution video and still photography to document, analyze and publicize the results. WASHINGTON — From its headquarters here, the National Highway Traffic Safety Administration writes the rules and regulations that govern automotive safety. But the prevailing standards for safety in today’s auto marketplace actually are being developed in an office building across the Potomac River in Arlington, Va., and at a campus in the rural village of Ruckersville, Va., about a two-hour drive away. These are the twin operating bases of the Insurance Institute for Highway Safety, the insurer-funded nonprofit organization that has developed outsize influence on the progress of vehicle safety, accelerating the pace of improvements in crashworthiness and aggressively driving the adoption of crash-prevention technology, while federal regulators play catch-up. IIHS crash tests in many ways go beyond what’s required by the federal government, and automakers have responded to the results by making substantial engineering changes at a fast clip. IIHS’s access to proprietary insurance claim data allows it to see the greatest areas of unmet need in automobile safety and identify technological solutions to address them. And the group’s Top Safety Pick and Top Safety Pick+ accolades have become must-haves for automakers. That standard keeps evolving. As a private group with access to rich data and a branded rating system that’s routinely cited in marketing materials, IIHS can move quickly to encourage the proliferation of promising safety technologies in the marketplace without fear of pushback from industry lobbyists or other political forces. In 2012, for example, IIHS added a small-overlap crash test and a new award category, Top Safety Pick+, to recognize vehicles that did well on the test. More than 50 vehicles from the 2012 model year were subjected to the small-overlap crash test; fewer than 10 earned top marks. Many automakers scrambled to improve their performance, and the number of vehicles rated “good” has grown each year since. A year later, IIHS beefed up the criteria for a TSP+ rating by requiring that vehicles be equipped with crash-prevention systems that met the “basic” rating. Last year, it again raised the bar, requiring vehicles to receive “advanced” or “superior” ratings on the performance of those crash-prevention systems. Meanwhile, at NHTSA, crash-prevention technology is still under study. The agency completed reports about the safety benefits of crash-prevention systems in 2012 and detailed its refined testing procedures in a report last August. The 2012 study found that the technology would prevent some 200,000 minor injuries, 4,000 serious injuries and 100 deaths annually if equipped on every light vehicle. Based on those results, the agency took the limited step in January of recommending automatic braking, forward-collision warning and lane-departure warning technologies on new cars, but it stopped short of including them as criteria in its 5-Star Safety Ratings system. Any mandate would be years away. One key reason for IIHS’s faster track is its constituency. NHTSA represents taxpayers and the driving public and has focused heavily on crashworthiness to minimize injuries and deaths. IIHS works for the insurance industry to help reduce not only injury and death claims, but also vehicle and property damage claims. So IIHS has been far more aggressive in testing and promoting crash-prevention technologies. To be sure, NHTSA plays a critical role in requiring that the safety technologies adopted by automakers meet certain minimum performance requirements. The regulatory process to mandate a technology involves deep study and comment by the industry. While IIHS can move faster than NHTSA, the agency says, the two work toward the same goal. IIHS sees itself as a supplement to NHTSA, helping automakers to set their priorities and provide them with a clear business case to continually push the envelope of safety systems. IIHS’s role as an independent validator was on clear display in 2004, when it released findings that electronic stability control could halve the roughly 14,000 single-vehicle crashes that occurred on American roads each year. At the time, NHTSA was still studying electronic stability control, which was found mostly on luxury and high-performance cars. IIHS’s study helped changed that, Krafcik says. NHTSA mandated electronic stability control starting with the 2012 model year. 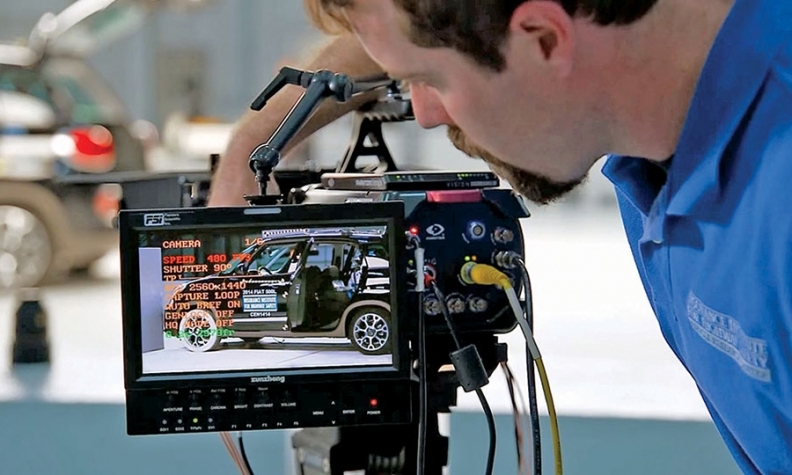 Jeff Babcox, a technical director at the Insurance Institute for Highway Safety, works in a postproduction studio at the Vehicle Research Center to process crash-test footage and edit it into finished videos. IIHS predates the formation of NHTSA, and even the Department of Transportation. It began in 1959 as a research organization funded by insurance companies holding about 80 percent of all auto policies in the U.S.
William Haddon Jr., the first chief of the federal highway and auto safety agencies that would become NHTSA in 1970, left the government and took the helm at IIHS in 1969. He pioneered IIHS’s data-driven, scientific approach to improving auto safety and reducing the toll of vehicle crashes. In 1995, IIHS began to take a more assertive role with automakers by introducing its first high-speed crash test, the partial-overlap front test. The 40-mph crash, in which about 40 percent of a vehicle’s front end strikes a barrier, was designed to be more stringent than the federal government’s frontal-crash test. At the time, it was derided by automakers as unnecessary and dubious, says Lund. But that skepticism faded as IIHS engineers began working with their counterparts at automakers, he said. A big reason for IIHS’s influence lies in the vast store of insurance claim data provided by its member companies through the Highway Loss Data Institute, which was founded in 1972. With those data, IIHS is able to evaluate the effectiveness of safety technologies as they enter the market, providing valuable feedback to automakers. For example, a 2012 study from the Highway Loss Data Institute to measure the effectiveness of crash-avoidance technologies found that the Volvo XC60 crossover with Volvo’s City Safety automatic-braking feature experienced a 20 percent lower rate of collision claims than other luxury midsize SUVs, a 15 percent lower rate of property damage claims and a 33 percent lower rate of bodily injury claims. The average cost of those collision claims was $450 lower, and overall collision claim losses were $92 lower per claim, the study found. That led IIHS to add front crash-prevention systems as a criterion for its 2014 Top Safety Pick+ awards, Lund says. In 2012, according to research firm IHS Automotive, 2.3 percent of vehicles produced in North America were equipped with collision-warning or automatic-braking systems. That grew to 3.9 percent in 2013 and 4.5 percent last year. It’s forecast to hit 7.5 percent this year. Jeremy Carlson, a senior analyst with IHS who monitors advanced driver-assist systems, attributes the growth to more testing of the technology ahead of a 2017 mandate in Europe, falling costs of the systems and the impact of the IIHS ratings. Similarly, Lund says, insurance claim data have documented a reduction in multivehicle accidents and bodily injury claims for vehicles with adaptive headlights that turn as a vehicle steers. “That’s probably our next technology we’re going to recognize because we’ve been able to document it clearly,” Lund said. The Insurance Institute for Highway Safety, founded in 1959, occupies a unique place in auto safety. As a nonprofit founded and funded by insurance companies, it’s not encumbered by the bureaucracy of federal auto safety regulators or the budgetary concerns of automakers. And it doesn’t play a role in lobbying. Photos and videos produced at the Vehicle Research Center are often used by news outlets to illustrate stories about vehicle safety, and in automotive advertising. What makes IIHS’s approach particularly influential is the cutthroat competition in the auto industry today, not just for sales but for supremacy on safety. Each tweak of the safety standards adds pressure on automakers to improve their products accordingly. In effect, the existence of the TSP+ category pushes automakers to shoot for an 11 on a scale of 1 to 10, with some confidence that the marketplace will reward them. IIHS also goes to great lengths to earn exposure for its work. The crash-test area at the group’s Vehicle Research Center in rural Virginia is part laboratory, part Hollywood soundstage. It’s decked out with an array of high-speed, cinema-quality cameras and lights to document every test from multiple angles, along with editing studios that produce high-quality videos and images of each crash test that are posted online and made available to news outlets. Lund says there’s only so much more safety improvement that IIHS can squeeze out of inventing new crash tests. The real payoffs to come are in preventing accidents or sharply reducing their impact. “Increasingly, we’re going to be looking at technologies that bring crash speeds down to the speeds we’re already testing,” Lund said. That will mean testing new active safety features and connected-car technologies that allow vehicles and infrastructure to communicate over wireless networks and warn of impending hazards. For that reason, IIHS is in the middle of a $30 million expansion of its Vehicle Research Center in Ruckersville, a village tucked into the foothills of the Blue Ridge Mountains. It will include a covered test track for year-round testing. The project is expected to be completed in early summer.